First, it has to be beautiful,then, the rest is a pleasure. Anna Maria's Conservatory is a gathering of beautiful art from uniquely talented artists. Anna Maria’s Conservatory is composed of Anna Maria Horner, Monika Forsberg of London, Arounna Khounnoraj (Bookhou) of Canada, Courtney Cerruti of San Francisco and Nathalie Lete of Paris – renowned artists from diverse corners of the world whose work complements Anna Maria’s timeless and fine art-based approach to design. “The Conservatory takes the FreeSpirit tradition of gathering incredible artists under one brand a step further by creating collections that offer compelling crossover in styles while maintaining the individual artist’s distinct point of view,” said Anna Maria Horner. “What I know as an artist is, first, it has to be beautiful.” The idea is the culmination of Anna’s formal training in fine art, self-taught love of arts, crafts and quilting and valuable industry experiences as spokesperson, designer, author, instructor and, most recently, shop owner of Crafts South in Nashville. Her passion for her art is supported by the sales experience of working with customers to compose quilts that strike that one of a kind mix of a number of designers. “As an artist, that unexpected composition of different fabrics coming together to create beautiful quilts speaks to me. 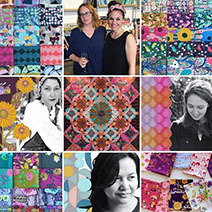 As a retailer, I’ve watched the practice inspire quilters and grow business. This is what I want to share,” said Anna Maria.